This one-bedroom condo is located on the fifth floor fronting one of Puerto Rico's alluring beaches with breathtaking views of the blue/green ocean & white/golden sand. The condo has a fully-equipped kitchen with a spacious living room that opens up to spectacular views of the Atlantic Ocean and San Juan Coastline. You can see the cruise ships (illuminated at night)entering & exiting San Juan Harbor. Sleeping accommodations include: two twin beds in the bedroom which can be joined to make a king size bed. There is a sofa in the living room which has a pullout platform to make a king size bed(82'l x 56'w). There is also a full size futon with a full mattress. There is a baby stroller stored on the premises. This condo sleeps 4 adults or 5 persons when occupancy includes young children. There is AC in the bedroom only as well as a ceiling fan. There is no AC in the remainder of the condo. There is a ceiling fan in the living room and cross-ventilation with windows and door open on opposite sides. All bath towels and bed linens are provided. Beach towels toiletries and personal hygiene items are not provided. There is direct access to the bathroom from the living room and bedroom for privacy. Keyed elevator access to the 5th floor for security. There is a laundry room on the ground floor of the building. The condo has an assigned parking space(use for guests of condo 5a). 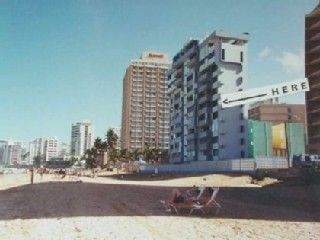 Parking is otherwise not available without a price and inconvenience in the Condado Area of San Juan. Amenities: High-speed wireless broadband internet access, local telephone, AC(bedroom), Cable TV, Stereo Tape Deck, CD Player with Radio, DVD player, board games, Iron, Kitchen Utensils, Microwave, Coffee Maker, Blender, etc. in fully-equipped Kitchen. Supermax Supermarket is nearby for shopping. Fresh Mart is nearby. There is a 24-hour mini-mart in Walgreen's Pharmacy one block from the Condominium. There are a variety of shops, restaurants, casinos, and fast food establishments in the Condado Tourist Area. Activities: Swimming, Surfing, Snorkeling, Boating, Fishing, Diving, Golf, Tennis, Hiking, Biking, Wildlife viewing, Horseback Riding, Walking, Sightseeing or Shopping. Book a tour with the Marriott Hotel or rent a car at a nearby agency: Charlie, Avis, L&M, etc. You can print out airline ticket at the Marriott Hotel across the street. Area: Some activities are either in the Condado Tourist area or less than a 45 minute drive (Example: Golf, horseback riding). You may participate in the Tours offered by the hotels in the area. Old San Juan is 10 minutes away. You can catch a bus at the corner of the street to get to the 'Old City'. The airport is located 6 miles from the Condominium building. Condominium Stella Maris is located next to the Marriott Hotel and one block from the Best Western Plus Condado Palm Hotel. The hotels in the Tourist Area of Condado welcome visitors to use the restaurants, casinos and participate on hotel sponsored group tours. The Marriott Hotel will require a daily or weekly fee for use of the swimming facilites, excercise room and tennis courts. Planet Fitness is a little over one mile away. The bathroom has a shower and bath tub. Towels are provided. Soap and personal hygiene items are not included. Coin operated washer and dryer located on the first level with keyed entry. Coin operated in level laundry room. Direct oceanfront view with small balcony. The dishes and glassware are located in the living room cabinets next to the dining table and chairs that extend from the wall unit. Dining area is located near the living room windows.The dining table and chairs are located with a dircect view of the ocean. The condo is located on the fifth floor. A person would need to ascend or descend the stairs in the event that the elevator malfunctions. The building was not designed with a ramp at the main entrance. There is a step at the entrance to the building. There is only one elevator to access the floors. A handicapped person would not be able to gain access to the fifth floor when/if the elevator is not working. There are security cameras installed in the lobby, front entrance, at elevator and parking areas of the building. The elevators have keyed access to each floor. The outside of the building has continual lighting during the night. Great location right on the beach with spectacular sunrises!!! Fall asleep to the sound of the waves!!! It just doesn’t get any better! Cross the street to use Marriott hotel’s concierge services for all types of tours or simply catch an Uber for a quick ride to all the main attractions! If you change your mind and wish to rent a car, there’s a lot within walking distance! Paulet is a great hostess with quick responses to any questions! I highly recommend and will definitely return!!!! Staying at this condo right on the beach in Condado was great. Overlooking the beach with the sound of the waves was the best. I spent most of my time on the balcony enjoying the view. Everything you need is very close and within walking distance. I did not rent a car nor did I need one. The city bus is only .75 to get to Old San Juan. We felt very safe there with the security level to get into the condo. I would highly recommend this condo over a stuffy hotel room any day. The owner Paulet is very nice and accommodating, the condo is very clean. Thank you for a very informative review. I hope return sometime soon. I loved my stay in this condo! Could not be closer to the beach with an incredible view. I enjoyed going nextdoor to the Marriott pool and/or renting a beach chair in front of the condo. I'd go back in a heartbeat! Thank you for a lovely place to stay in a lovely place. It was a pleasure to host you during your visit to Puerto Rico and I hope to welcome you again in the future. Me and my family had a wonderful time in Paulet's apartment. It is a perfect location right in the heart of Condado. This is a beachy apartment with everything you may need, and most importantly, you will wake up and go to sleep with amazing sea breeze and the sound of the waves. Paulette was super responsive to every request or inquiry we had. The place is safe, with friendly neighbors and overall very convenient. Highly recommend! Location, Location, Location. Right on the beach and short walking distance to shops, restaurants, nightlife, drugstores, grocery, and casinos. I would definitely recommend staying here. Nicer part of PR means we felt completely safe. Perfect location if you love the sound of the ocean!